1. Heat a large skillet over medium heat. Coat both sides of each salmon fillet evenly with seasoning; cover and cook for 3–4 minutes per side or until opaque throughout and blackened. 2. Meanwhile, in another skillet, bring the broccoli rabe and 1/2 cup water to a simmer. Cover and cook, tossing occasionally, for 3–4 minutes or until tender; drain and transfer to a plate. 3. Wipe out the second skillet, and heat oil over medium heat. Add the shallots and salt, and cook for about 3 minutes or until softened. Mix in the raisins and broccoli rabe. 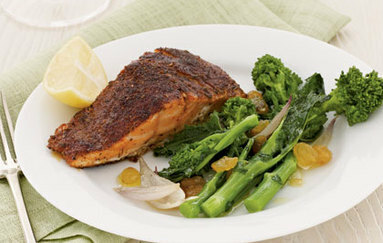 Serve with the salmon and lemon wedges.